Thinking of having a summer wedding in Austin, but worried that it sounds like a recipe for dead plants and uncomfortable guests? Never fear, our gardens are beautiful year-round with native plants that are adapted to different seasons. Furthermore, our beautiful Artisan Ballroom, featured in the background of the above photo offers a glass walled view to the outside, making the space feel airy and open, without also being exposed to the outdoors. The Pride of Barbados, a tropical bush with lovely red and orange flowers blooms in the summer and fall. This deciduous shrub/small tree is, in fact, a true tropical beauty; it’s the national flower of Barbados. Thankfully for our grounds, it is also very well suited to the climate in Central Texas. Photo courtesy of Steven Noreyko Photography. This past weekend, we held our Third Harvest Tasting in the ballroom for this season’s couples. Running from August 15th to November 31st, the Third Harvest represents the rich bounty of autumn and the decadence of fall flavors. Thanks, Steven Noreyko for the photographs! Just a delicious sneak preview of the photos from our recent Third Harvest Tasting. We hold a seasonal tasting four times a year for couples who are planning on getting married in our space. This year’s third harvest brides and grooms will have the option of selecting homemade s’mores as part of their dessert menu. Fluffy, brûlée marshmallow sits atop dark chocolate ganache on a freshly baked graham cracker in this all-organic delight! Thanks, Steven Noreyko for the photograph! Not every couple has the confidence to choose a wedding venue site unseen, but we are so happy that Lindsey and Nathan chose us for their “destination” wedding. 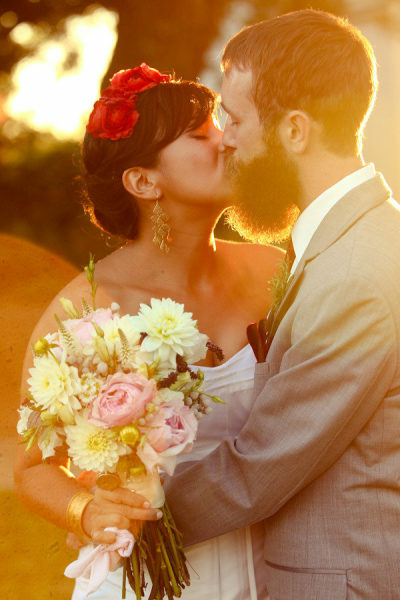 The couple met in DC, lived in New York City, and now reside in Berkeley, CA. They chose Lindsey’s hometown, Austin for the wedding so that their friends and family could enjoy this little town they love so much. Check out their lovely wedding, featured today on Style Me Pretty Texas, photographed by the talented Kim Maguire Photography! With vintage flair, up-cycled accessories, custom-crafted dress, and an absolute cornucopia of succulence, Clara and Matt‘s wedding was truly a sight to behold. It’s no wonder that this gorgeous wedding, photographed by The Nichols was featured today on Green Wedding Shoes! Barr Mansion & Artisan Ballroom is looking for a gardener to keep the gardens beautiful and sustainable. We are developing gardens that integrate organic vegetables with ornamentals. the organic standards as the foundation with permaculture principles guiding the process. Hours are 40 hours/week and pay is commensurate with experience. Send resume and cover letter to Melanie@BarrMansion.com. Around the country, summer weddings are popular, but in Texas, the summer months tend to be slow as folks fight concerns about the heat and the discomfort it can bring. We want to encourage you to re-think your idea of a summer wedding in Austin and consider these five factors for why having a wedding in June, July or August could be a wise choice! Price. It’s no secret that dream wedding venues can be pricey, but in Texas, you’ll find deep discounts during summer months. In fact, summer brides can see savings in upwards of 20-30% off regular prices during the “slow season”. All of that savings can go towards making your wedding spectacular in other ways, with say, outdoor misters, shade structures, or more refreshing mojitos for your guests! Vacation Time. One of the most stressful parts of picking the perfect wedding date is ensuring that all your most important guests will be able to attend. Perhaps your best friend is finishing up her last semester of graduate school or your older sister is wrapping up a medical residency and has limited free time. Often, the summer months are the best for your loved ones, who are still in school or who have regular full-time employment and need to travel, to take time off. Lighter Fare. Feeding your wedding guests can be challenging and the summer months afford you the opportunity to opt for more seasonally appropriate, lighter fare. We assure you it is much easier to get away with serving appetizers only on a sultry, warm summer night that it is on a cool fall or spring evening. Plus, if you love summer produce, like tomatoes, peppers, eggplants and summer squash, these months are the best time to get this bounty fresh and locally. Long Days. With gloriously long summer days, the possibilities to catch daylight for your wedding are seemingly endless. A sunset wedding can happen on an “off” weekday as late as 8:30pm, leaving your local guests ample time to get ready and head over after work. Brunch ceremonies can be sun-drenched affairs, held in lovely indoor or outdoor spaces before the day gets too hot to handle. Also, summer evenings are absolutely divine for dancing late into the night. Attire Appropriate. We’ve seen on a number of wedding blogs that it is estimated that 75% of all wedding dresses are sleeveless, meaning that an evening ceremony in the fall or winter may leave the bride chilly. In the summer, a gorgeous sleeveless gown in a lighter fabric can not only be stunning, but also comfortable. Guests may also find it liberating to enjoy more casual attire, such as light linen suits and brightly colored dresses. So, a wedding with beautifully dressed, happy guests enjoying luxuriously long days and delicious, light seasonal favorites – all for an affordable price. Sounds like a winning formula for a summer wedding to us! This past May, Richard and Amy celebrated their love in a beautiful, vintage wedding ceremony and reception. The entire event was filled with love and laughter, as well as the inventive touches of whimsy and personality we love to see our couples bring to the venue. Our couple enjoyed a flawless spring day with a lovely garden ceremony, followed by sunlight drenched reception in our Artisan Ballroom. The photos were taken by the talented Julie Wilhite and you can see the full collection here. We love weddings that express the individuality of the couple and Doug and Celina’s lovely fall wedding was no exception. Complete with a chuppah, breaking of the glass, and a mariachi band, this pair blended rich colors and traditional touches to create an absolute stunning sunny afternoon ceremony that was featured Style Me Pretty Texas today. Be sure to check out all the photos in their gallery, shot by our friends at Hyde Park Photography! We are best known as an amazing and versatile wedding venue, but did you know that we can also host corporate and other large scale events? Recently, we watched our Artisan Ballroom and gardens transformed to host the Patrón Aficionados Program. Our hand-hewn venue served as the perfect backdrop for an event meant to bring together local mixologists, bartenders, store owners and consumers to celebrate and appreciate the process of creating Patrón, which from growing to distilling to bottling, is done entirely by hand. Check out some of our favorite shots from this evening and next time you’re considering creating a beautiful, immersive event, think about us as your venue of choice! Huge thanks to Josh Baker of AzulOx for these great photos.